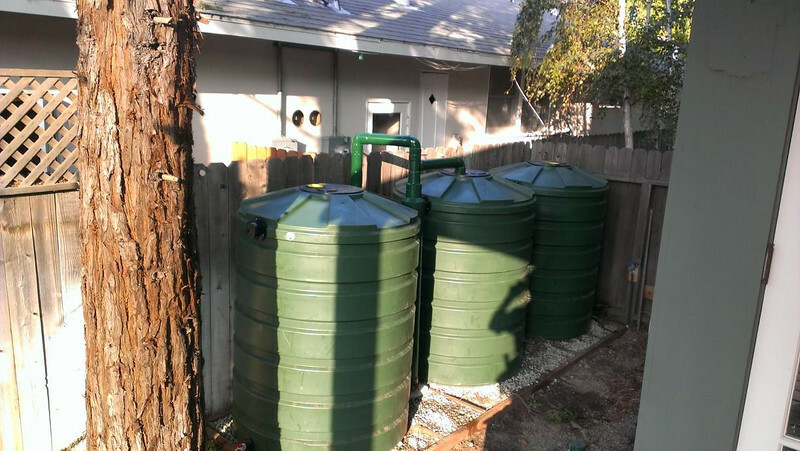 1000 square feet of roof yield 600 gallons of water per inch of rain. 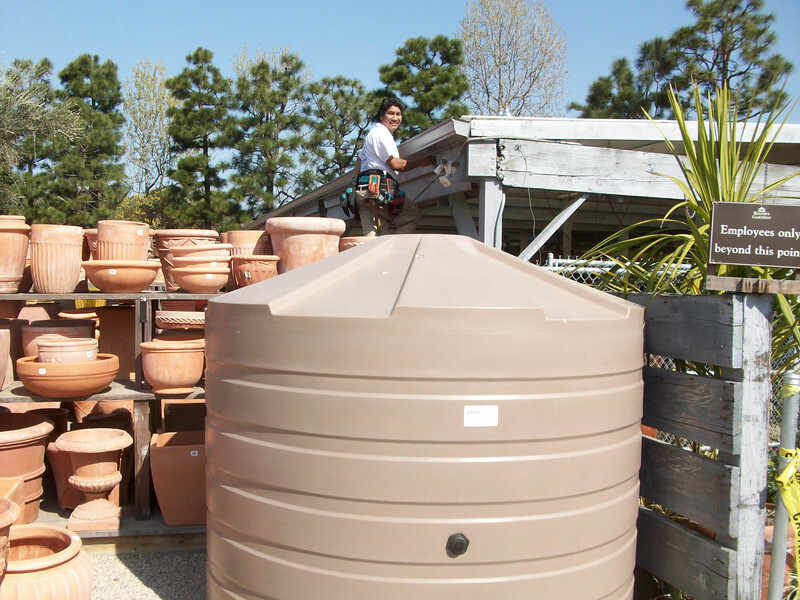 We are creating a balance between beauty, conservation and function. 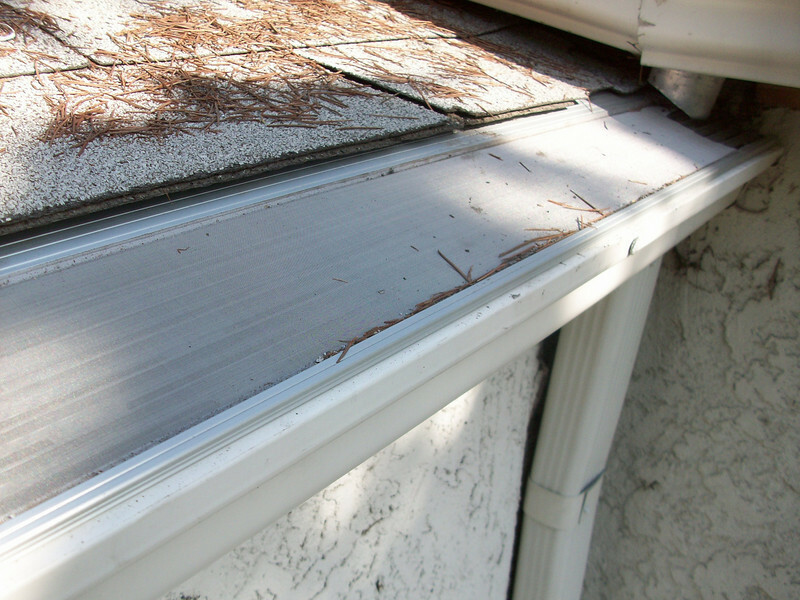 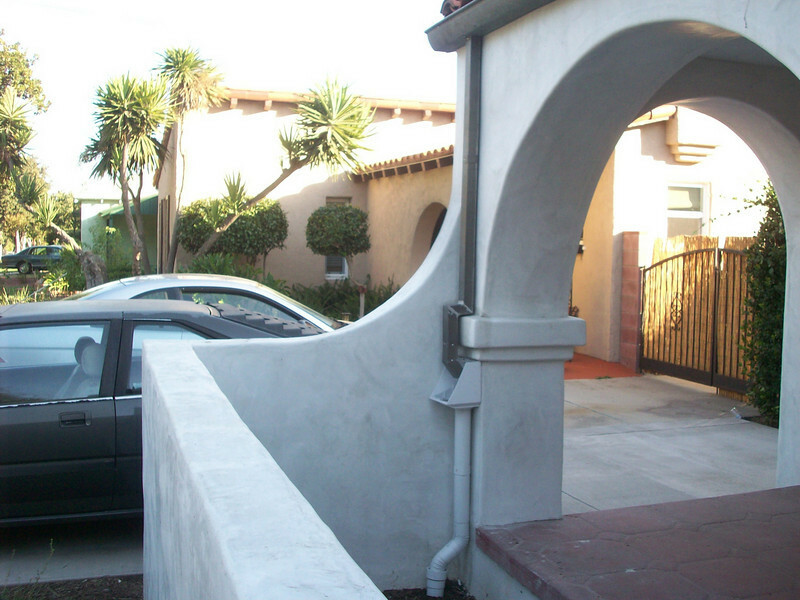 We are the number one recommended installation company in Southern California by the manufacturer Bushman and we have hundreds of installations and an extensive and unusually artistic background in gutter and roof metal. 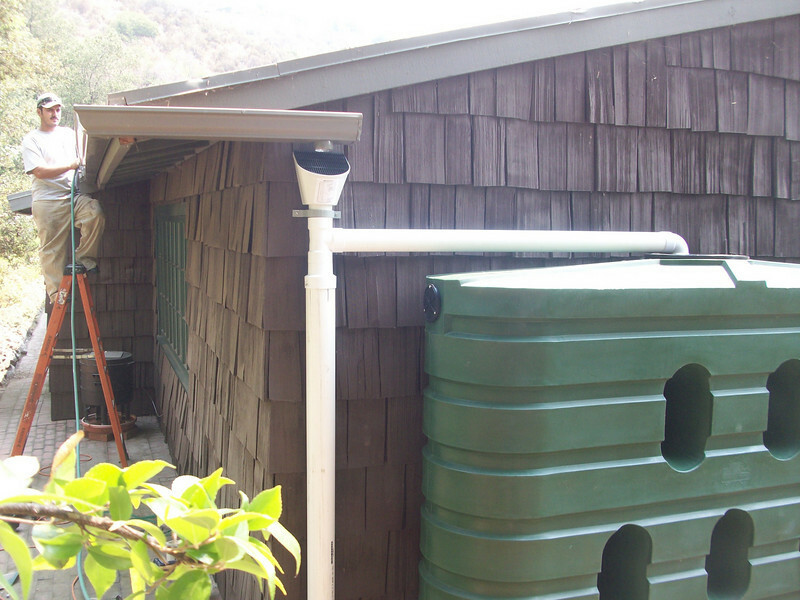 We are distributors for Bushman raintanks, Rainperfect Solar Pumps, Classic Gutters, Gutterglove and offer custom first flush devices and affordable stainless steel fittings. 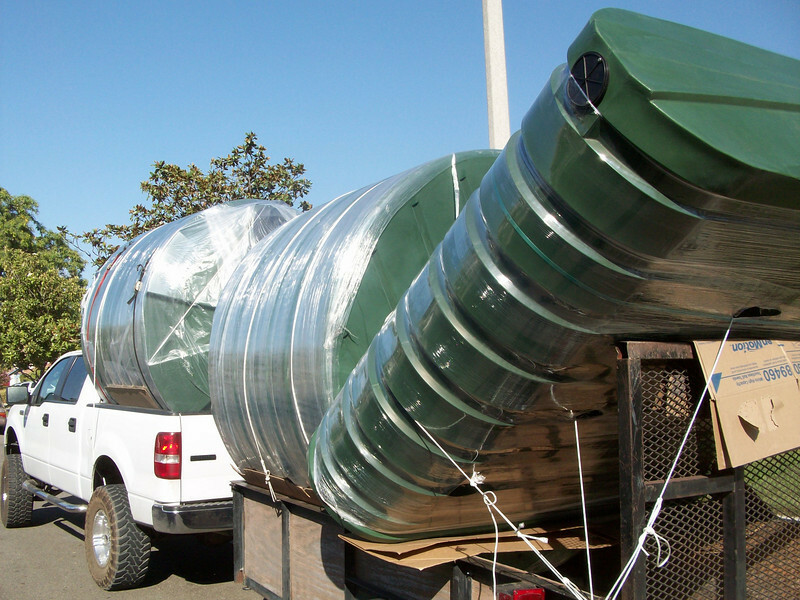 I can wholesale these tanks to DIY and ship most anywhere. 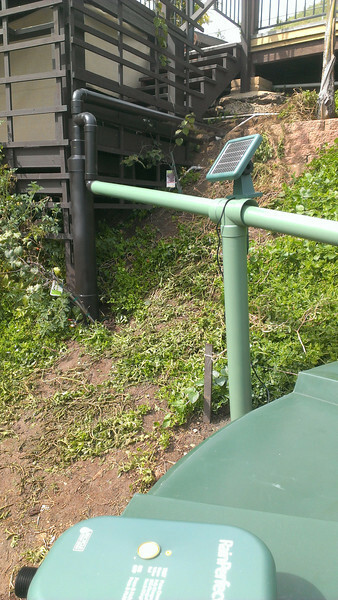 Here are various examples of our installations. 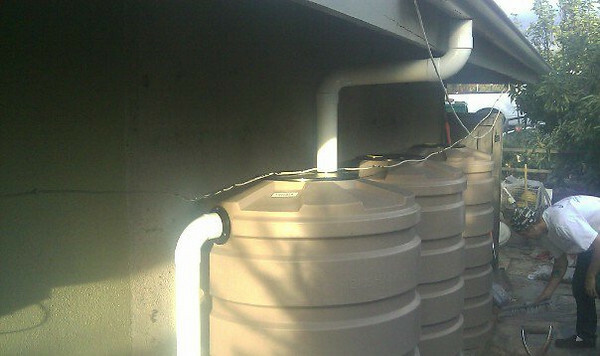 This shows an example of a " wet " rain water harvest system. 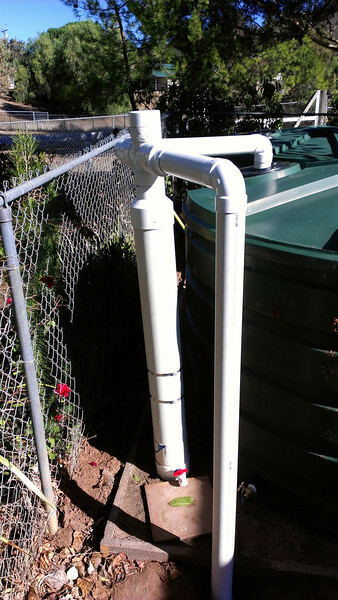 That is where a pvc pipe is used instead of a regular downspout to drain the water from the gutters, under ground and away from the house. 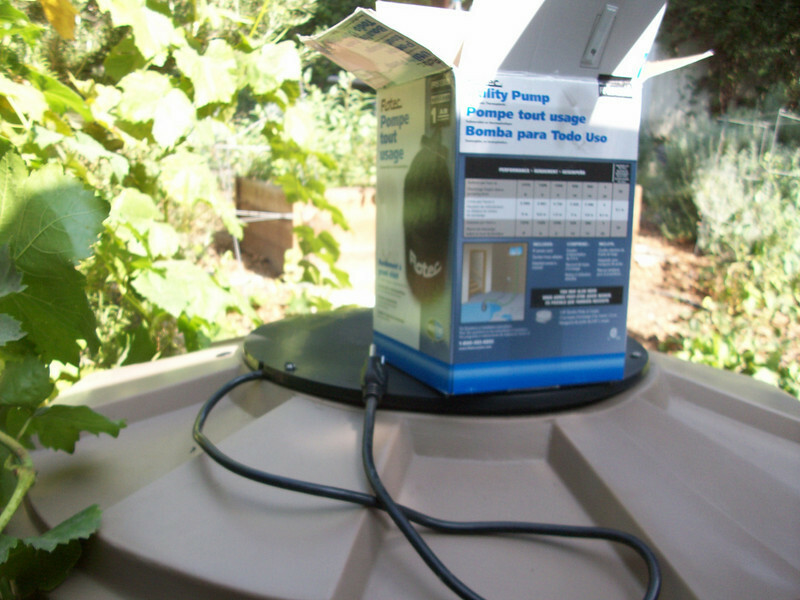 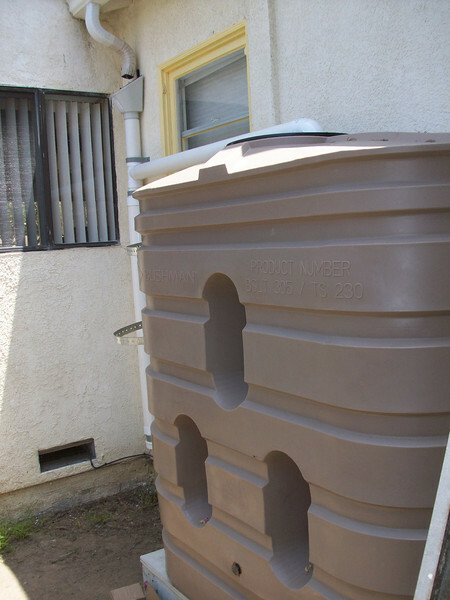 The tanks can be located wherever you want and as long as the gutter is at least 18" above the fill point of your tanks the tanks will fill when it rains. 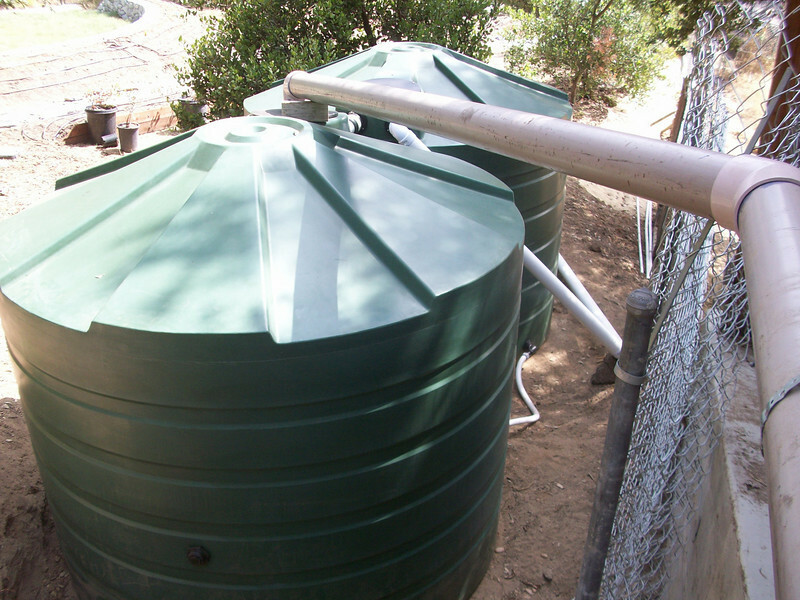 Green Bushman 620 Slimline rain storage tank. 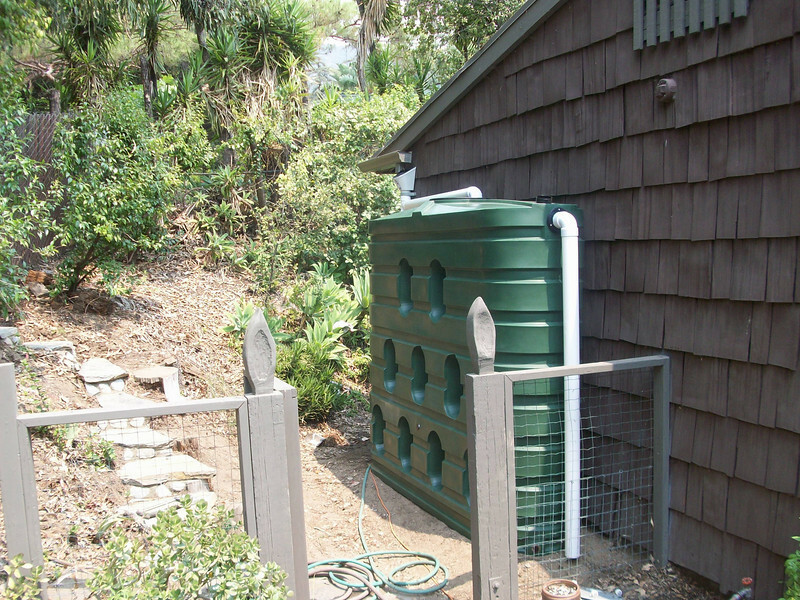 We offer a Bushman 3/4 h.p, filtered rainwater pump with a pump house in matching mocha color. 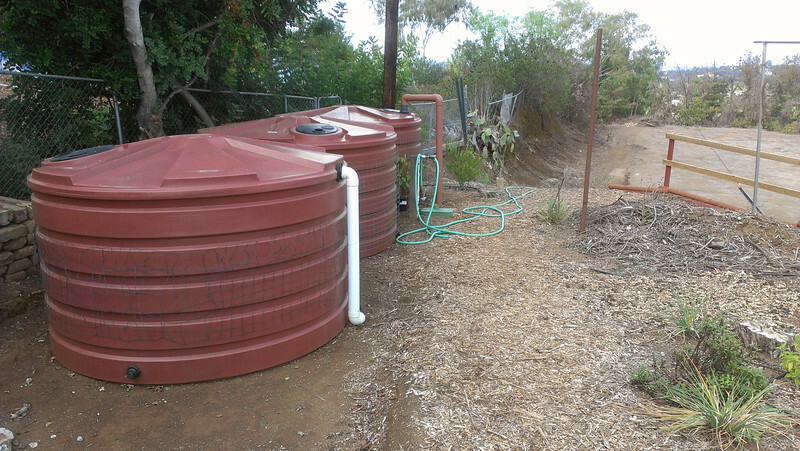 First flush sediment trap place next to three 205 gallon Bushman round tanks. 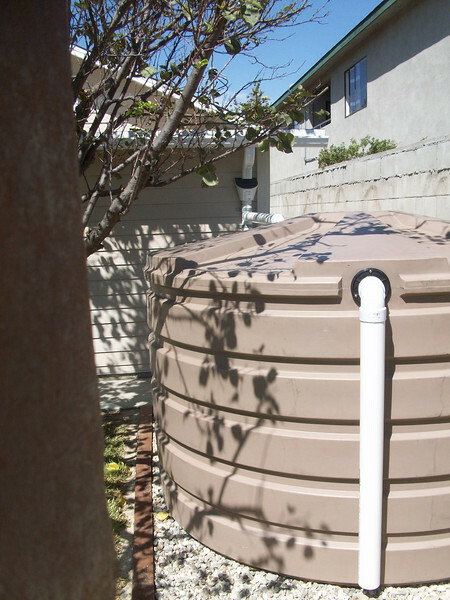 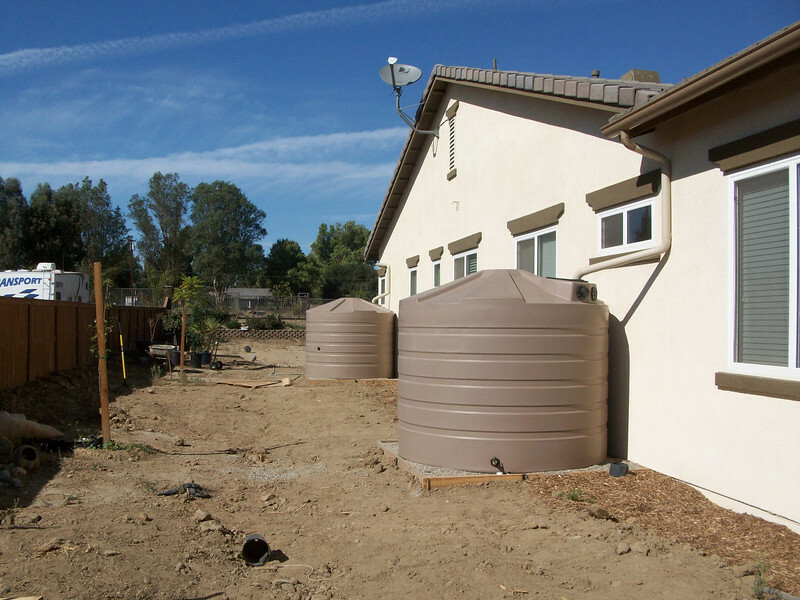 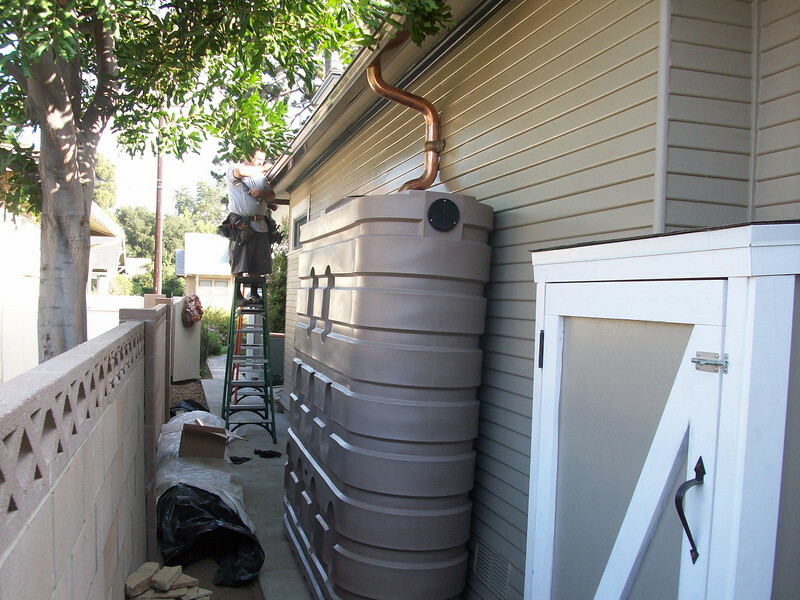 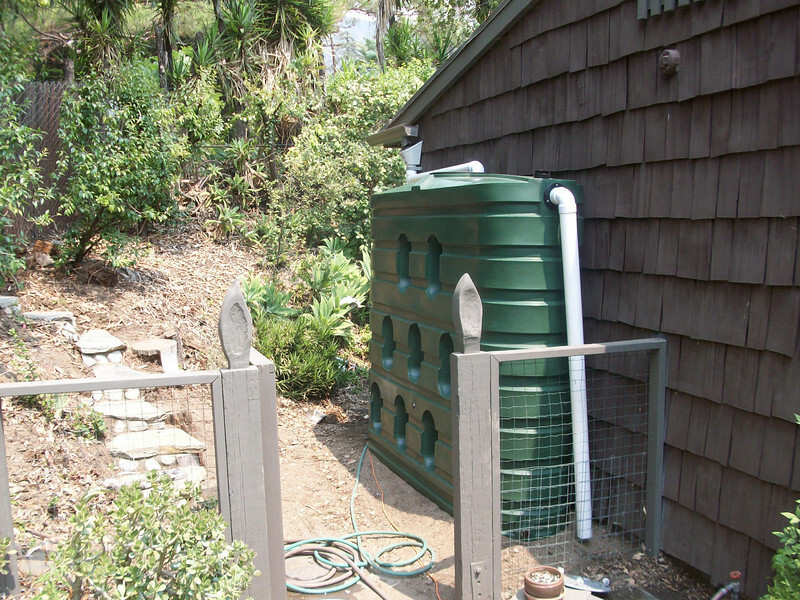 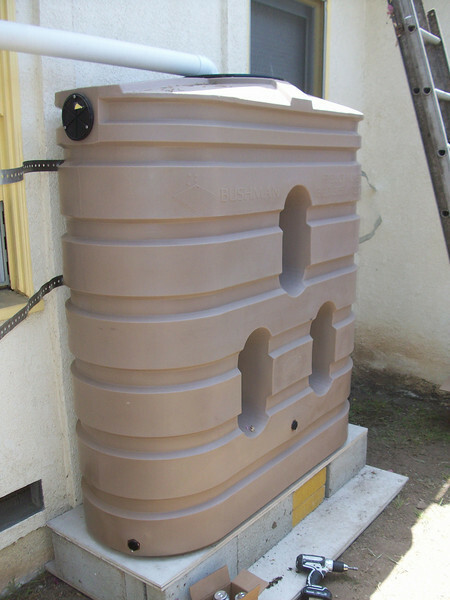 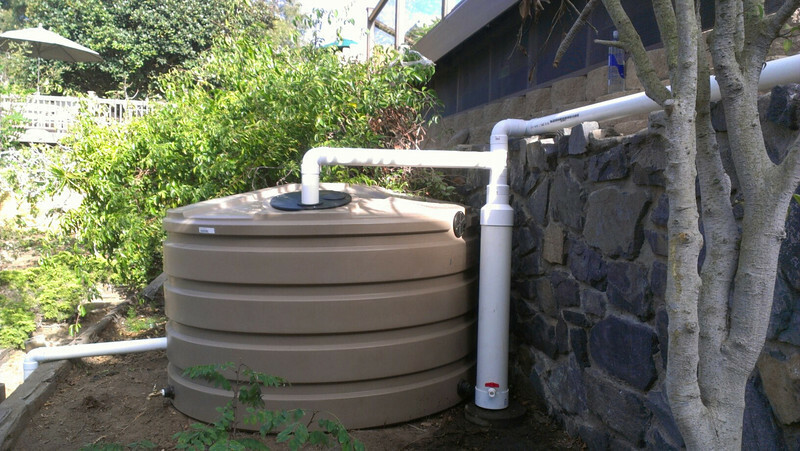 660 gallon cistern, or rain barrel in Los Angeles. 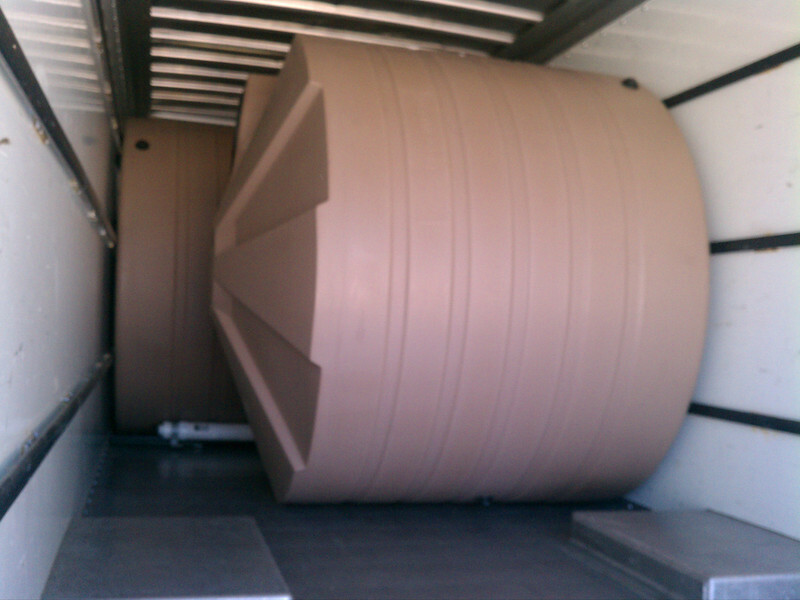 I own a large truck to bring in the big systems. 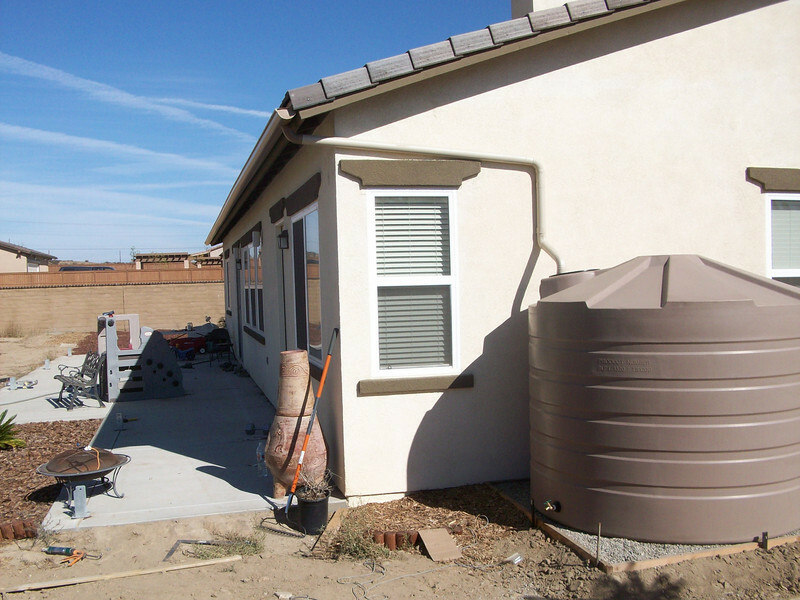 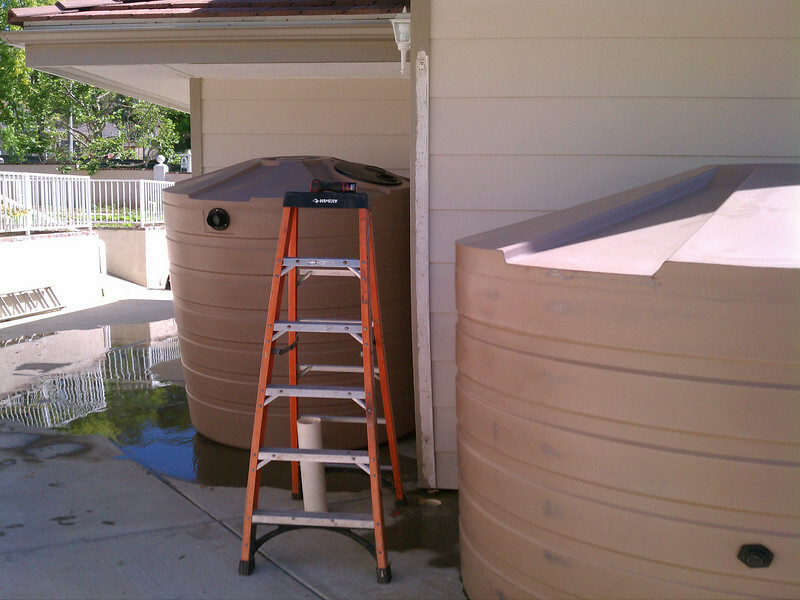 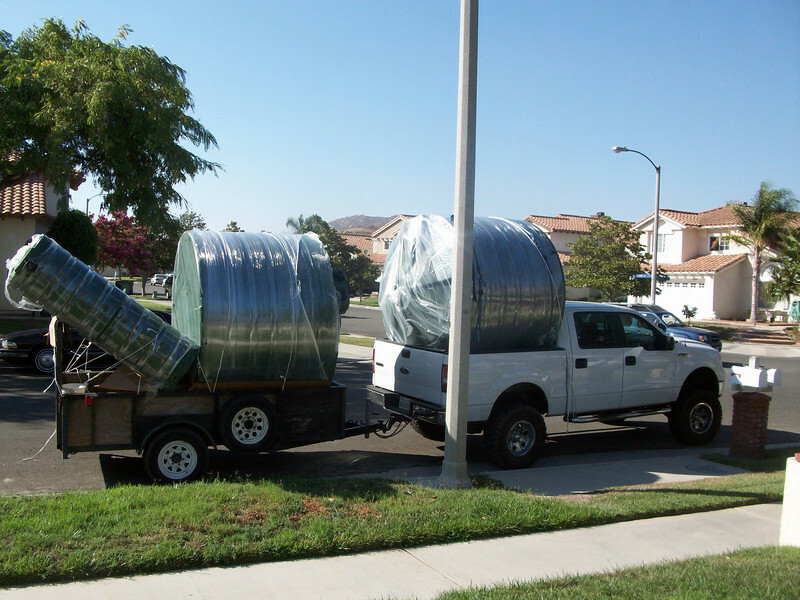 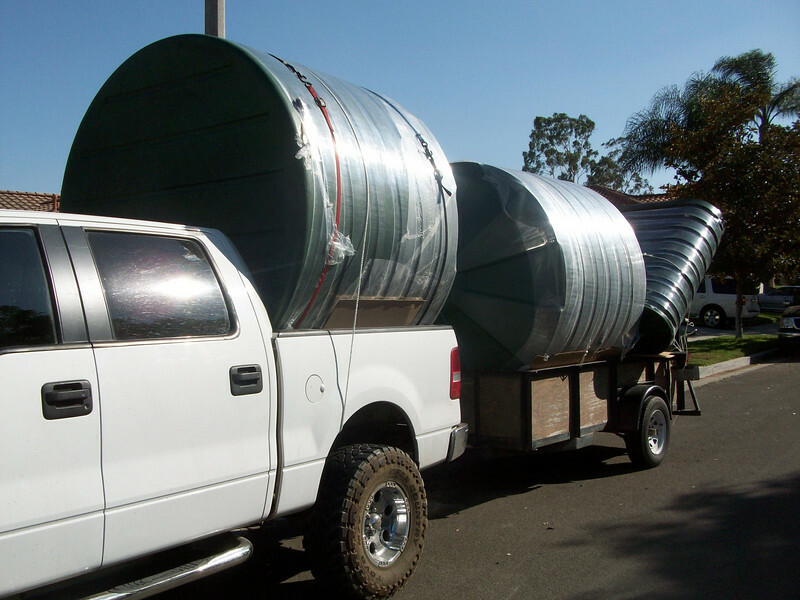 The large tanks are logistically challenging to transport, but you need to have a large capacity to deal with the large amount of rain water your roof collects, even in a dry area like Southern California. 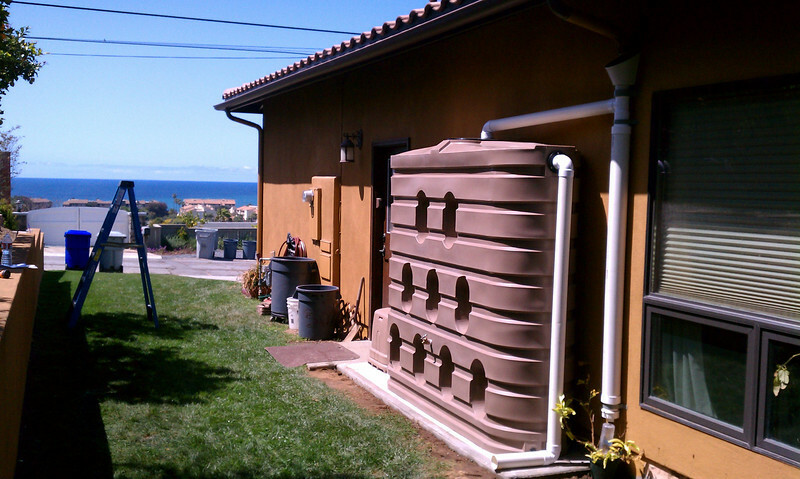 The cisterns may be considered part of an Earthquake emergency plan or used to fight fires. 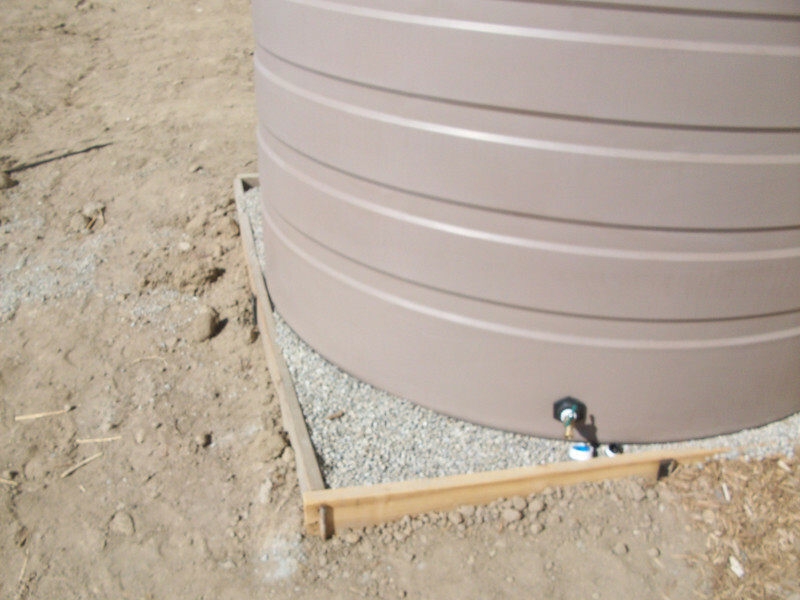 Framed tank beds are self leveling when filled with medium crushed gravel. 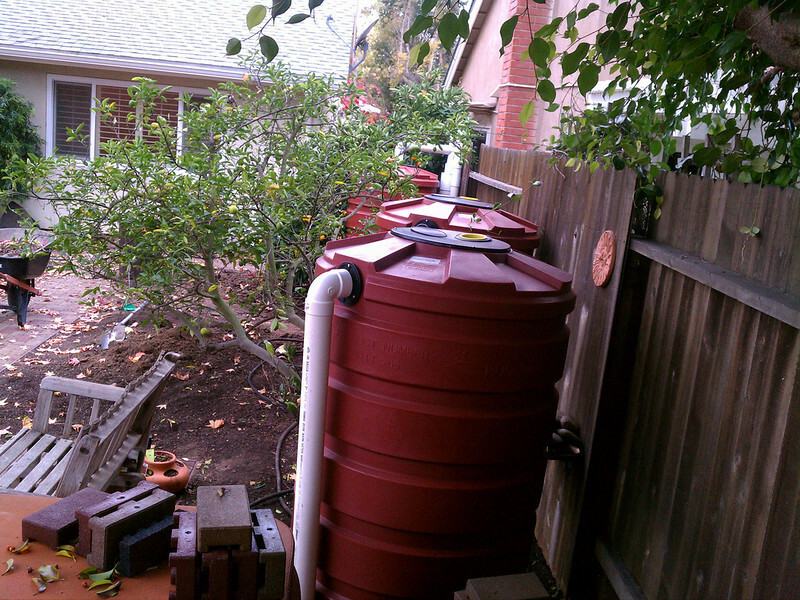 From $200.00. 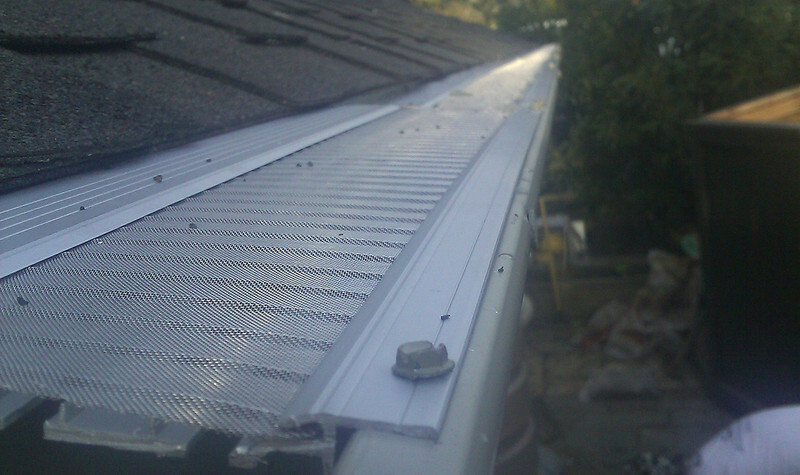 We have a seamless half round forming machine. 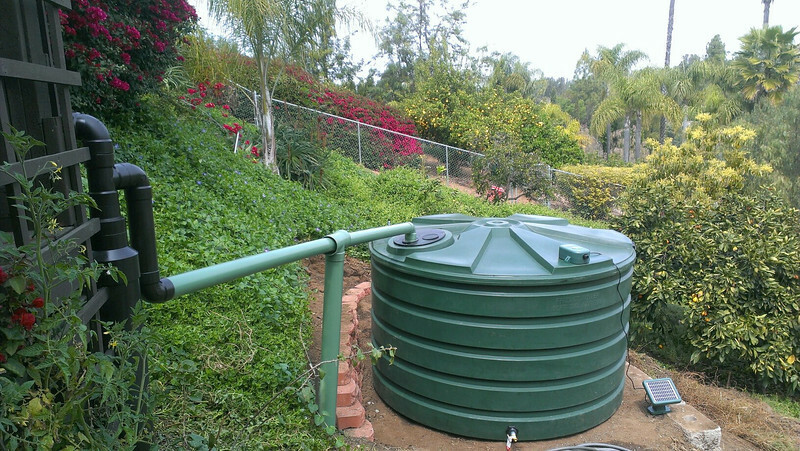 This 2X1320 gallon tank system was fed by a culvert that collected the water from a large driveway. 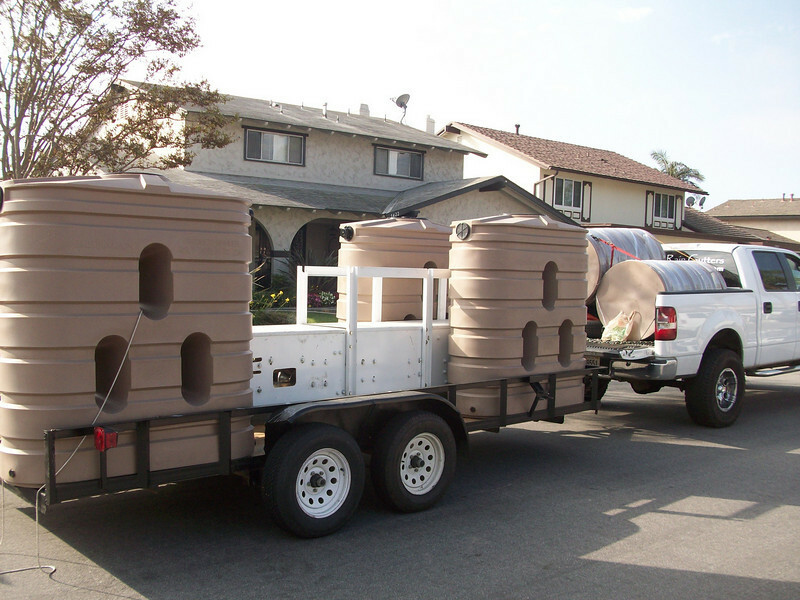 FUNFACT-One mile of two lane road collects some 87,000 gallons of water in one inch of rain. 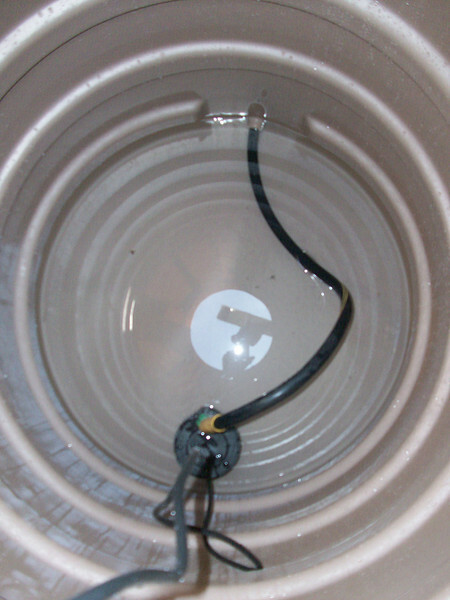 Installing the over flow connections in a large system. 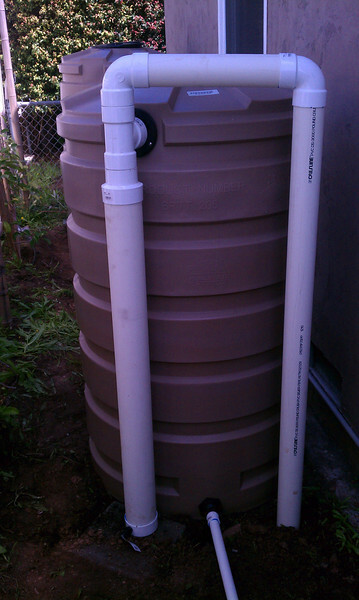 The First Flush Device gathers sediments and diverts the dirtiest first rain out of the cistern. 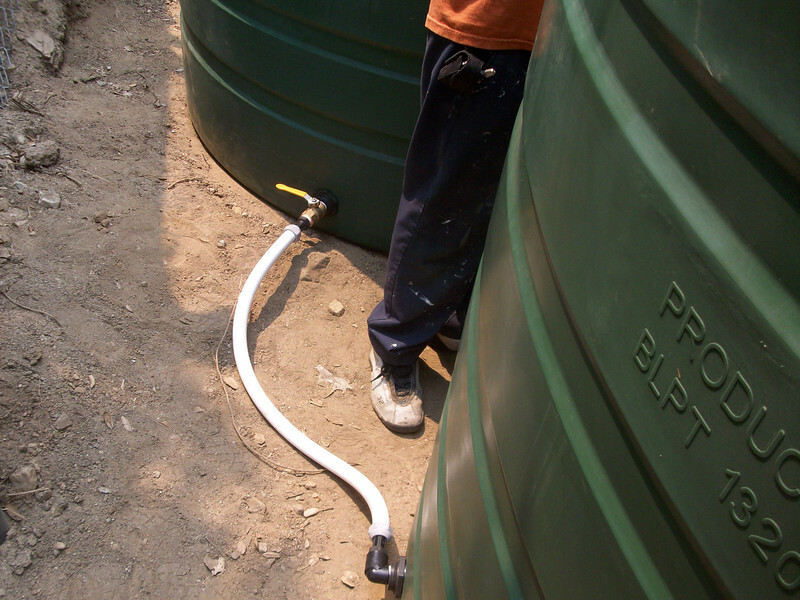 First flush device virtually eliminates large sediment from the tanks. 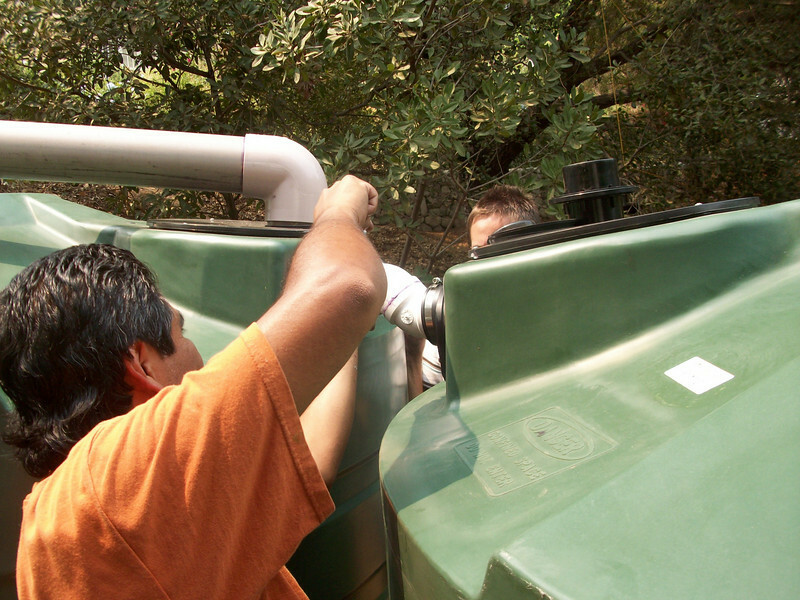 Our process has evolved to include ball valves between both tanks so that if there is a problem the water is not lost. 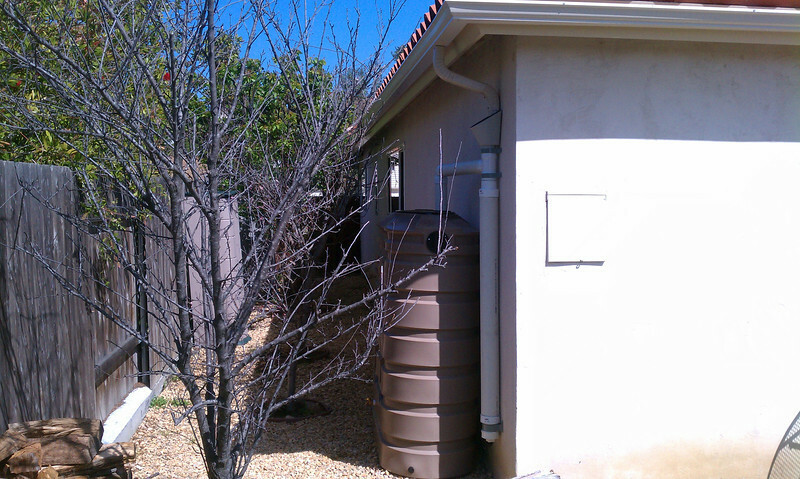 Rainwater harvesting starts with a high quality seamless gutter. 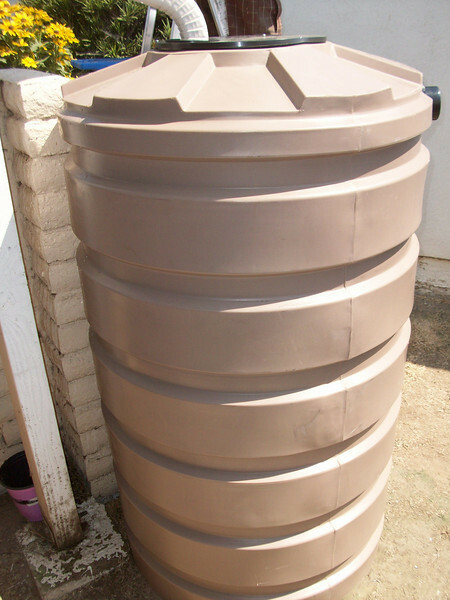 Mocha brown is by far the most popular color of the Bushman round rain barrels. 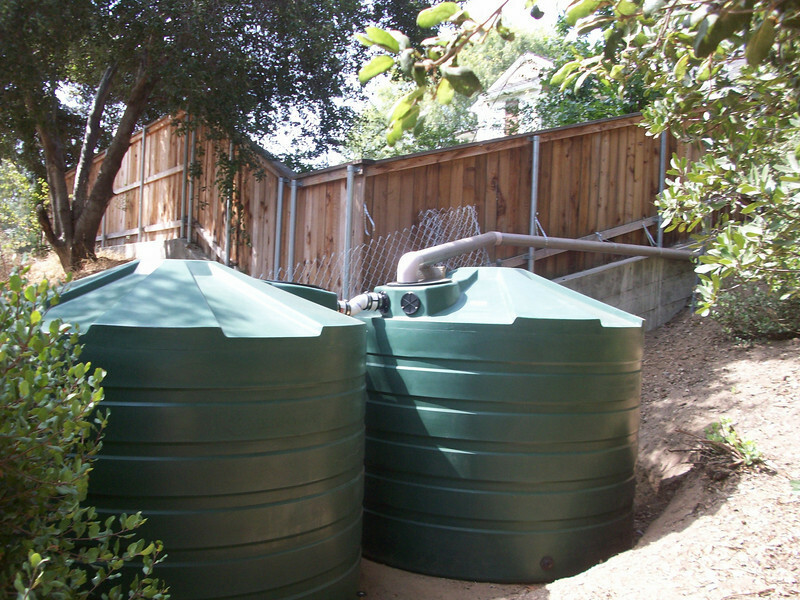 4" schedule 40 pipe fills these two 1,320 gallon tanks. 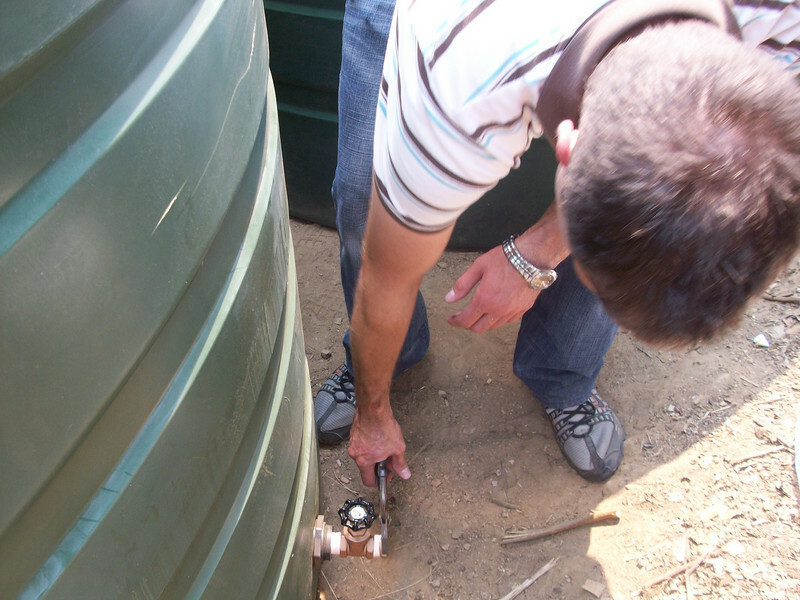 In this scenario a leaf filter is placed just before the drainage pipe goes underground to prevent clogging. 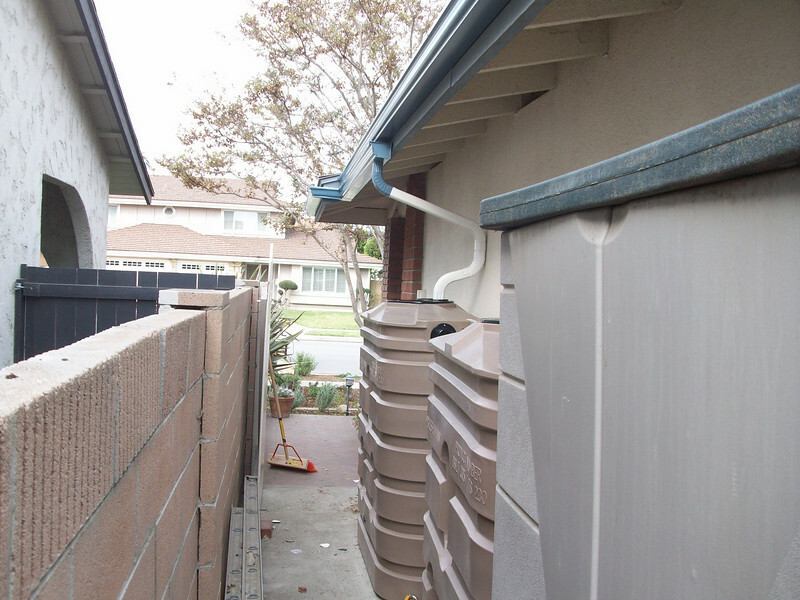 This customer was experiencing flooding of her garage. 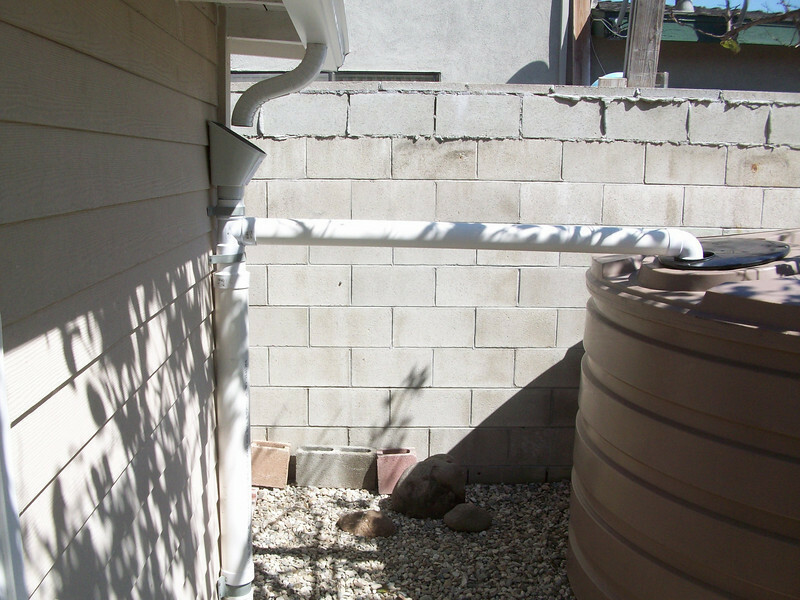 When a large storm is expected she fixes drain pipe to the overflow and runs it to the street. 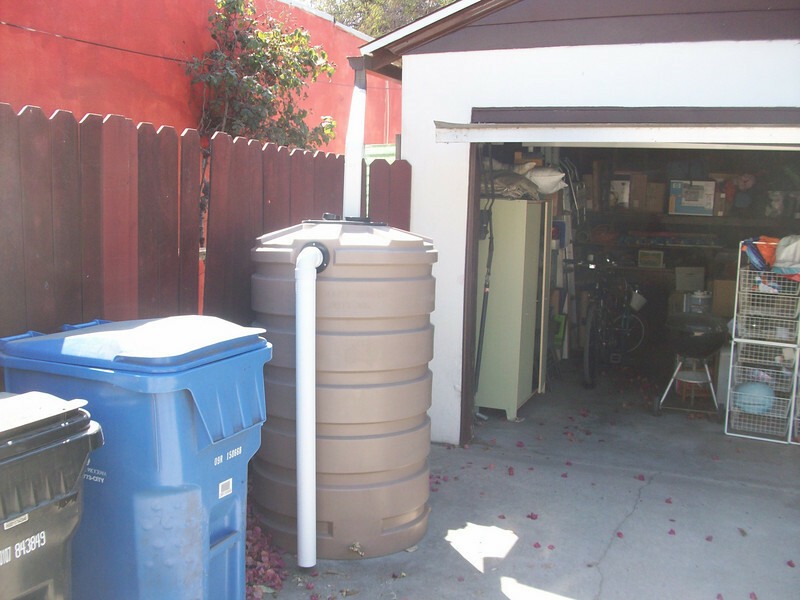 No more garage flooding, and she has 205 gallons of water for emergency storage and gardening. 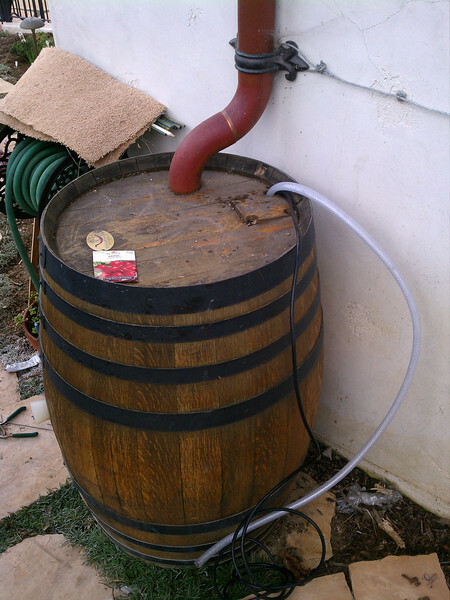 This is a wine barrel from a Temecula winery that I adapted for use as a rain barrel by adding a overflow, drilling a spigot and inlet hole The customer varnished the oak and painted the bands black. 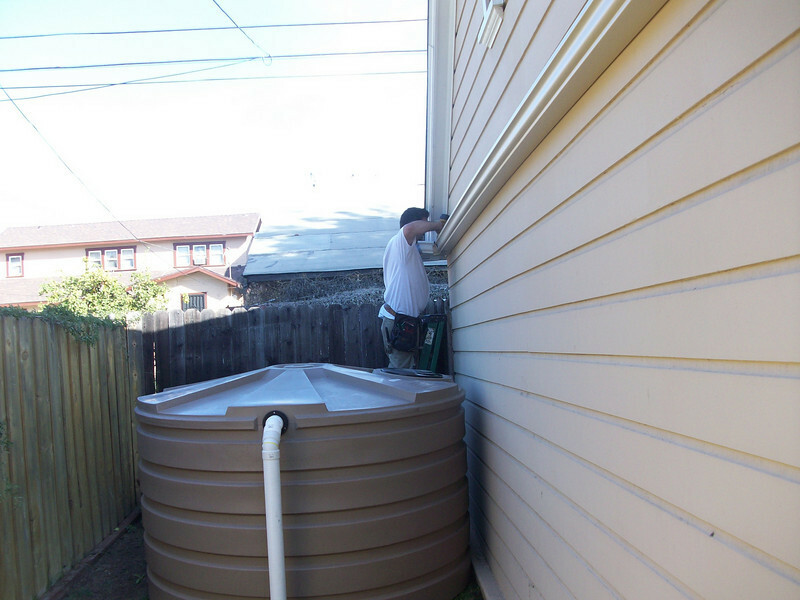 Pretty sweet. 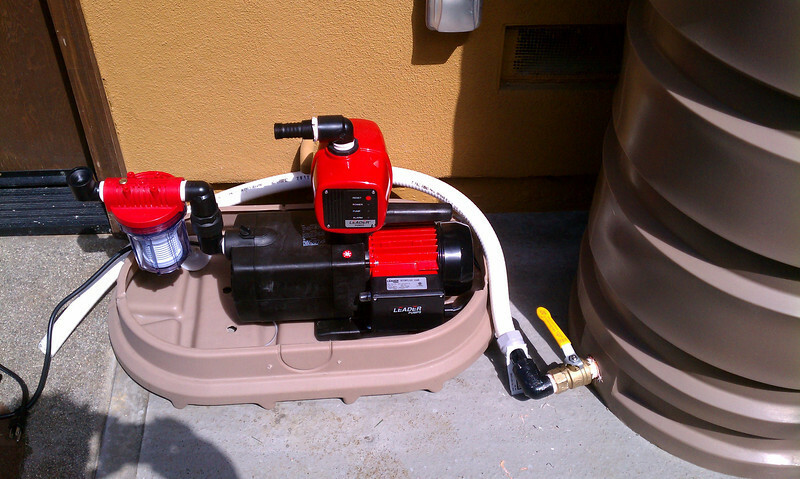 We are having good luck with these inexpensive Flotech utility pumps. 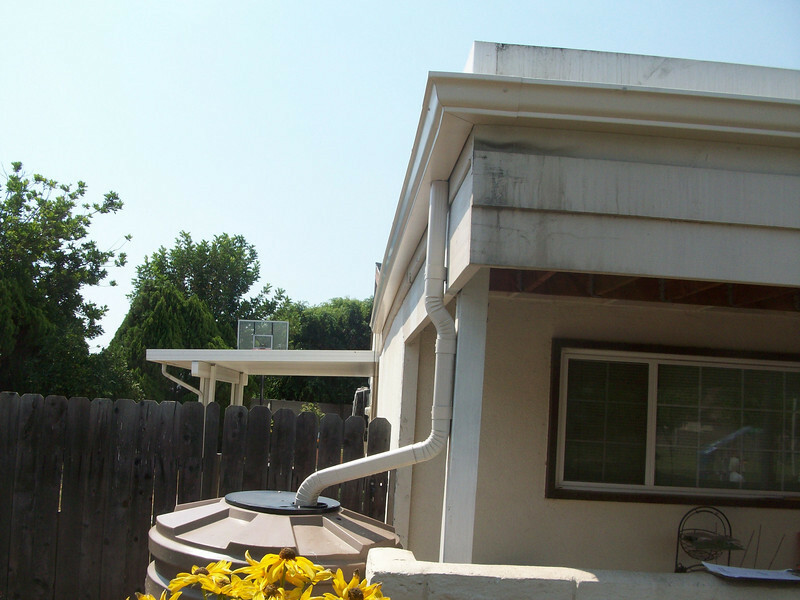 Trial and error. 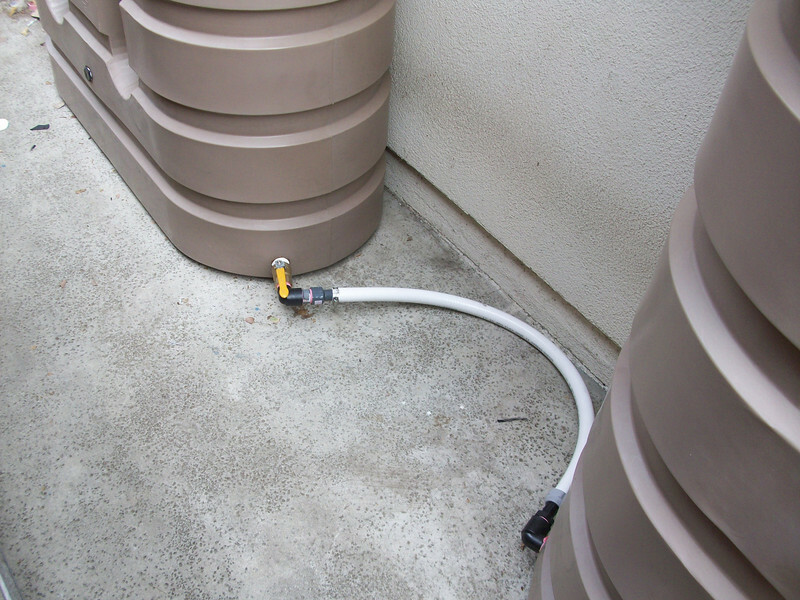 When I first started using them I ran the hose through the bottom. 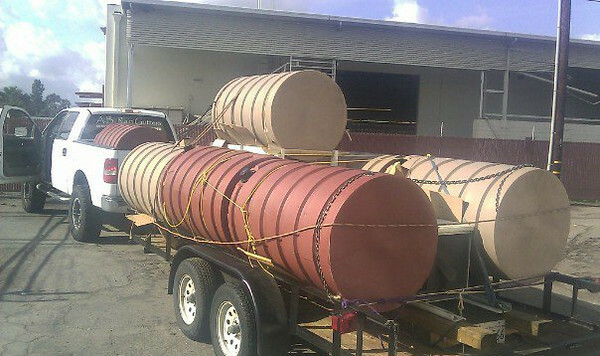 Now I run them up and out the top so that the barrels may ALSO drain via gravity.